[ #Mocha #Tracking #vfx ]Imagineer Systems, creators of the Academy Award-winning mocha® Planar Tracking technology, today released mocha Plus. “mocha Plus represents a new product category for Imagineer,” states Ross Shain, chief marketing officer, Imagineer Systems. “Now Adobe Creative Cloud customers have a clear distinction between mocha AE CC, which is bundled free with After Effects and Imagineer’s upgraded version which adds advanced features and support for Premiere Pro. mocha Plus addresses the growing needs of freelance artists and editors, hitting the sweet spot between needing advanced capabilities like planar tracking and roto tools, and budgeting constraints. After Effects users will also gain significant features by upgrading the Adobe bundled mocha AE CC to mocha Plus, with a special upgrade price of just $195 that truly cannot be beat.” Watch the mocha Plus 4 promo video. Replacing Imagineer System’s mocha AE product, mocha Plus adds professional VFX modules including a 3D camera solver, lens correction tools for After Effects and support for copying and pasting mocha roto masks directly to the Premiere Pro timeline. mocha Plus also supports a multitude of compositing and NLE applications including recent versions of Adobe After Effects, Premiere Pro CC 2014, Apple Final Cut Pro and Motion, HitFilm, and Boris FX plug-ins. -Support for Premiere Pro CC 2014 - Copy and Paste mocha Masks: Premiere Pro editors can now use mocha masks to isolate color correction, blurs and more. mocha’s advanced tracking and roto tools create accurate masks with minimal keyframing. Export multi-layered masks to AE, Premiere and FCP without rendering. -The customizable keyboard shortcut interface enables mocha Plus 4 users to edit and save customizable keyboard layouts or select industry standard keyboard layouts such as Adobe After Effects. -3D Camera Solver: 3D match moving made easy. Unlike feature based tracking, mocha solves the 3D camera based on user-selected planes. This fast and easy-to-use solution is ideal for set extensions, 3D text and particle tracking. -Lens Correction Tools for After Effects: This simple and easy-to-use interface allows users to calibrate the distortion introduced by camera lenses. Unwanted lens distortion can be removed or matched for realistic compositing. Export to the free mocha Lens plug-in for After Effects to undistort footage or distort your final composite. -2.5D planar tracking: mocha’s 2.5D planar motion tracking engine accurately follows translation, scale, rotation, skew and perspective. Unlimited tracking layers handle reflections, obstructed and blurred objects, and even areas with low detail. -AdjustTrack Module: The AdjustTrack module and overlay tools help solve tracking challenges with pixel-perfect accuracy. -Advanced Roto Tools: Create animated roto masks with less keyframes. X-spline and Bezier creation tools are purposely designed for artists to easily create detailed roto shapes. When linked to mocha’s planar tracking, roto shapes inherit motion and perspective, dramatically reducing manual keyframe work. Advanced tools for shape editing include per-point edge feathering, join layers tool, transform tool, group layers and more making mocha the ideal system for rotoscoping. 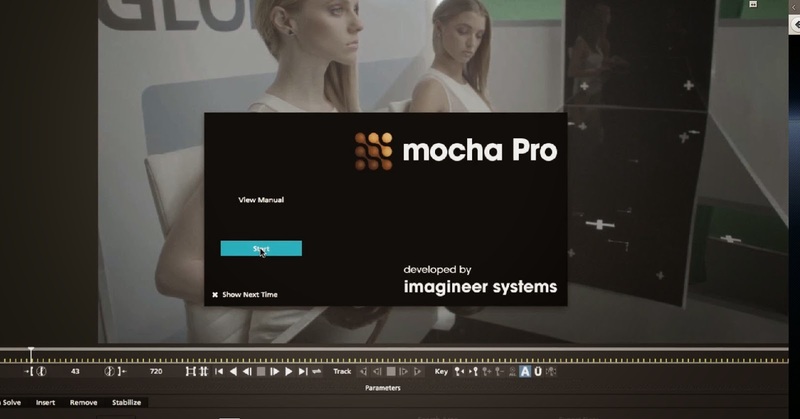 Imagineer Systems has also released mocha Pro 4. -mocha’s new Stereoscopic 3D workflow adds unique stereo support to planar tracking, rotoscoping, object removal and 3D camera solving. It also adds the capability to work on uncorrected, native stereo 3D footage. -Python scripting support allows facilities to further customize their workflows, integrating mocha Pro 4 deeper into the visual effects production pipe. -The customizable keyboard shortcutinterface enables mocha Pro 4 users to edit and save customizable keyboard layout or select industry standard keyboard layouts such as Adobe After Effects or Nuke. -The improved user interface plus high resolution retina display support greatly enhances the end user experience. -New exports and format handling includes support for Adobe Premiere Pro masks, Nuke 7 Tracker export and improved Nuke Roto exports. Version 4 also improves QuickTime and MPEG support. mocha Plus 4 is now available on Mac OS X and Windows. mocha Plus 4 supports recent versions of Adobe After Effects, Premiere Pro CC 2014, Apple Final Cut Pro v7, Apple Motion, HitFilm and Boris FX. Existing owners of mocha AE v3 can upgrade to mocha Plus 4 for just $95 USD. Adobe Creative Cloud subscribers can upgrade from the bundled mocha AE CC for just $195 USD; new users can purchase mocha Plus on the Imagineer Systems website for $245 USD. Special promotion: all mocha 4 upgrades will be on sale for 20% off list prices for the month of July. mocha Pro 4 is now available on Mac OS X, Windows and Linux with nodelocked or cross platform, floating licensing options. mocha Pro 4 supports Adobe After Effects and Premiere Pro, Apple Final Cut Pro and Motion, Avid|DS, Assimilate SCRATCH, Autodesk Flame, Smoke & Maya, Boris FX, Eyeon Fusion, HitFilm, Quantel, Maxon Cinema 4D, Red Giant Warp and The Foundry’s Nuke. Upgrades are available starting at $495 USD; new users can purchase mocha Pro 4 on the Imagineer Systems website for $1,495 USD. In February 2013, Imagineer Systems was honored by the Academy of Motion Pictures Arts and Sciences with a Scientific and Technical Award for mocha and its Planar Tracking technology. mocha was recognized for its robust tracking features and widespread adoption in the VFX industry. Over the years, Imagineer’s mocha software has gained acclaimed notoriety within the film and video community for its ability to “motion track” problematic footage such as out of focus and marker-less areas helping enable a technique called “digital makeup” or “seamless effects.” Visual effects artists use planar tracking to magically transform actors and locations without requiring timely makeup sessions and expensive sets, allowing directors to make important creative decisions long after the performance has been captured. Capturing accurate movement is essential and mocha has been involved in some famous digital makeup examples such as the snake-like noseless Lord Voldemort in the Harry Potter films, replacing Mystique’s eyes in X-Men and helping Natalie Portman undergo an amazing transformation in Black Swan.